Hanoi (VNA) – National Assembly (NA) Chairwoman Nguyen Thi Kim Ngan underlined the importance of judicial cooperation, which helps strengthen traditional cooperation between Vietnam and Mozambique, while receiving Mozambican Attorney-General Beatriz Buchili on August 21. At the meeting in Hanoi, the two sides hailed the countries’ relations since they set up diplomatic ties in 1975, adding that they have continually given enormous support to each other’s national protection and development. Chairwoman Ngan said aside from fine political linkages, connections in economy, trade, investment, education, agriculture and services have also been reinforced. 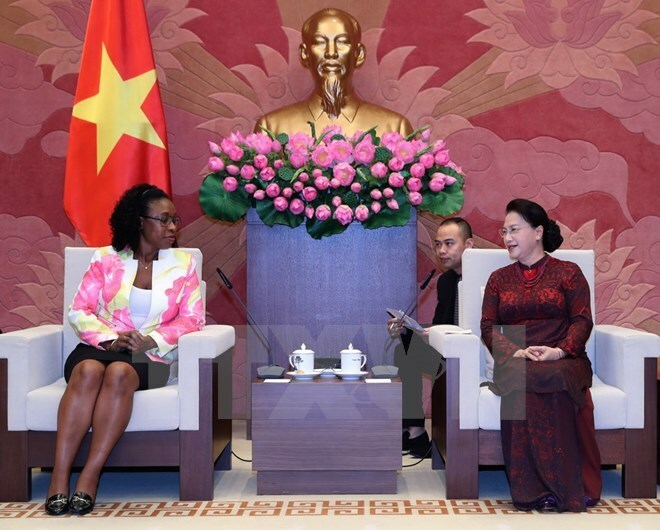 She affirmed that the Vietnamese National Assembly supports the Supreme People’s Procuracy of Vietnam and the Mozambican Attorney General’s Office to step up cooperation and information and experience sharing so as to serve the reform and completion of each country’s judicial system. She added the recently signed memorandum of understanding between the two agencies is an important legal foundation for them to boost cooperation activities in the time ahead. For her part, Beatriz Buchili said her delegation’s working visit to Vietnam aims to bolster judicial connections and learn from the Southeast Asian nation’s experience in fighting trans-national crimes and wildlife poaching and trafficking.